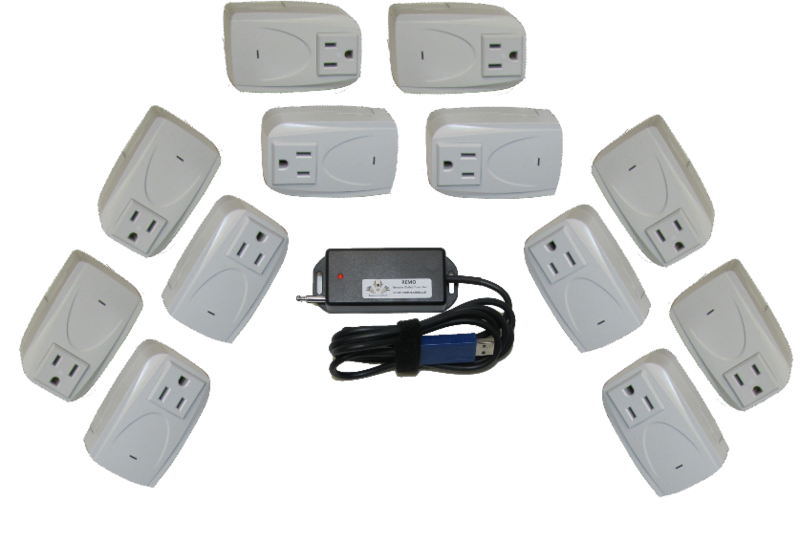 Control indoor/outdoor electrical devices from your computer! The Brand New REMO1A Computer controller kit comes with everything you need to control up to 12 devices through your PC. The module are compact and designed for Indoor use. The system can be used for short terms such as holiday lighting or permanently installed for home automation applications. The secret behind the product is the free software package called REMO Console. This software allows you to manage the outlets by allowing you to set timers, manual control or even write simple scripts to make the lights dance to music! Up to 80ft range – works through walls, doors and windows ( 433.98Mhz radio) *This item is a radio frequency devices (RF) and as such actual operation distant depends on many factors. Download REMO Console now and try Demo Mode! Settings page. Shows the current status of outlets, allows each to have a unique name such as “front lights”. Timers: There are 12 timers available for the outlets. One outlet can have use all 12 timers if desired. Timers can be set to turn a device ON or OFF between selected times of day. Program Editor: Allows the user to complex patterns or programs that allow the lights to dance to music. Music is selected from the users hard drive and plays on the computer speakers. This is a radio frequency device and is susceptible to interference in compliance with FCC Part 15. The transmitter uses a directional antenna to maximize the operation distance however the outlets (receivers) must be oriented to “hear” the transmitter. Outlets receive only and the program keeps track of ON/OFF commands but is unaware of the actual outlet status.